This sirloin steak will make an incredible meal. A little goes a long way with Japanese wagyu though as it’s very rich, so these two steaks are enough for a couple of very special guests. Japanese wagyu is a truly special meat. It is a completely different product to normal beef and even from standard wagyu beef. Unavailable in the UK until 2015, Japanese wagyu is reared and graded according to strict regulations so that quality is always paramount. This sirloin steak will make an incredible meal. A little goes a long way with Japanese wagyu though as it’s very rich, so these two steaks are enough for a couple of very special guests. Japanese wagyu is a truly special meat. It is a completely different product to normal beef and even from standard wagyu beef. 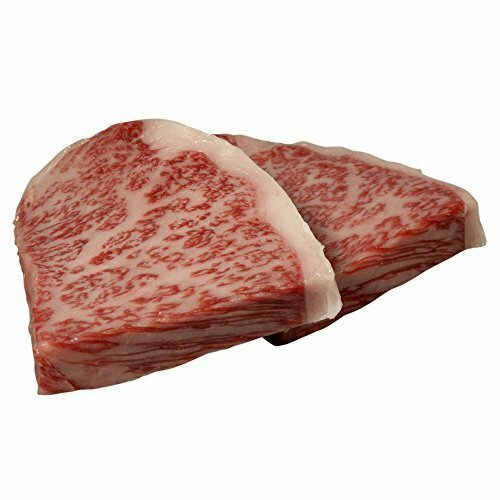 Unavailable in the UK until 2015, Japanese wagyu is reared and graded according to strict regulations so that quality is always paramount. Our wagyu is the product of 100% wagyu cattle that are raised in the Kagoshima prefecture of Japan. Kagoshima wagyu is incredibly tender with an intense, rich flavour. The meat is heavily marbled with fine, evenly distributed snowflake patterns of fat, which derives from a diet rich in wheat and corn for the final 18 months of feed. Our wagyu is the product of 100% wagyu cattle that are raised in the Kagoshima prefecture of Japan. Kagoshima wagyu is incredibly tender with an intense, rich flavour.The meat is heavily marbled with fine, evenly distributed snowflake patterns of fat, which derives from a diet rich in wheat and corn for the final 18 months of feed.